Beijing’s Aeronautics and Astronautics University just launched their “Polar Rover,” an autonomous research vessel that is exploring the effects of global warming on Antarctica. The 300 kilogram machine runs around the clock thanks to energy produced by a HoYi! turbine – Urban Green Energy’s (UGE) smallest vertical axis wind turbine. The Polar Rover and turbine are both built to withstand frigid temperatures, polar winds, geomagnetic interference and cosmic rays. Powered entirely by UGE’s HoYi! turbine, the Polar Rover is an incredibly sophisticated vessel. 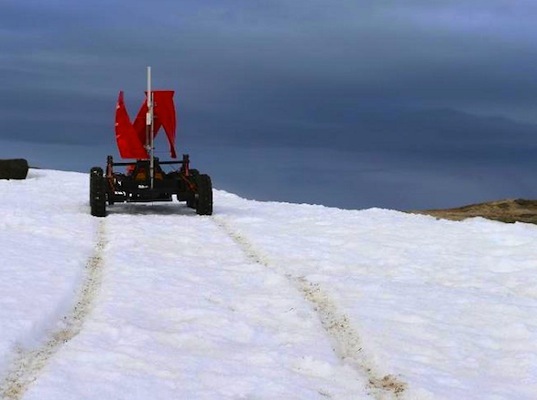 In addition to being able to hurdle over half meter tall obstacles, it has an automated driving system and is able to identify and assess ice and snow terrain and navigate by satellite. Dispatched to evaluate the affect that global warming is having on the frozen continent, the Polar Rover is also equipped with atmospheric sensors, a snow sampler, and geography and geology analyzers. 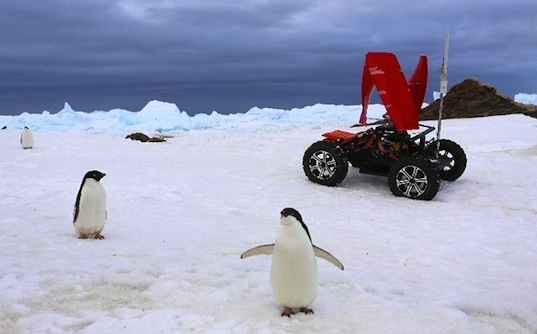 “The launch of this prototype is a milestone for implementation of intelligent robots at China’s unmanned research station in Antarctica,“ said Project Manager Wang Tianmao, a professor of Robotic Research at Beijing Aeronautics and Astronautics University. It is also a milestone for renewable energy as UGE demonstrates its ability to produce wind power in one of the most unforgiving natural environments on earth. Beijing's Aeronautics and Astronautics University just launched their "Polar Rover,” an autonomous research vessel that is exploring the effects of global warming on Antarctica. The 300 kilogram machine runs around the clock thanks to energy produced by a HoYi! turbine - Urban Green Energy's (UGE) smallest vertical axis wind turbine. The Polar Rover and turbine are both built to withstand frigid temperatures, polar winds, geomagnetic interference and cosmic rays.